The best offense is a good defense when it comes to the life of your trees. This versatile wrap can be used alone to prevent sun-scald, damage from rodent or mammal feeding and dark bruising from string trimmers. 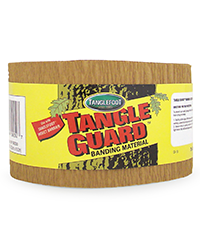 Or, use it with Tree Tanglefoot Insect Barrier to protect against gypsy moths, cankerworms, vine weevils and other crawling insects all season long.